Chicken salad is part of my upbringing and accompanies many vivid memories in my past. I remember growing up and having cookouts or family gatherings in the summer. Memorial Day… July 4… or just random get-togethers… with fireworks, drinks and food. Oh, the food! A variety of summertime dishes including hamburgers, pulled pork sliders, fresh fruit, and… chicken salad. Which is my favorite. Yes, I’m kind of biased. But my mother was the chicken salad guru of the family and she held a monopoly on making it for all our summertime gatherings. Well, I got to thinking. Why did we have chicken salad only during the summertime? I mean, there is never a shortage of chicken or the other ingredients. Really, chicken salad is not a seasonal food. It does not contain fleeting ingredients such as fresh Georgia peaches or sweet corn from the Carolinas. So as an adult, I’ve made it my mission to expand chicken salad from a summertime picnic staple to a year-round dish. One that can be enjoyed without someone doing a double take as if I’m wearing white after Labor Day. Chicken salad forever! 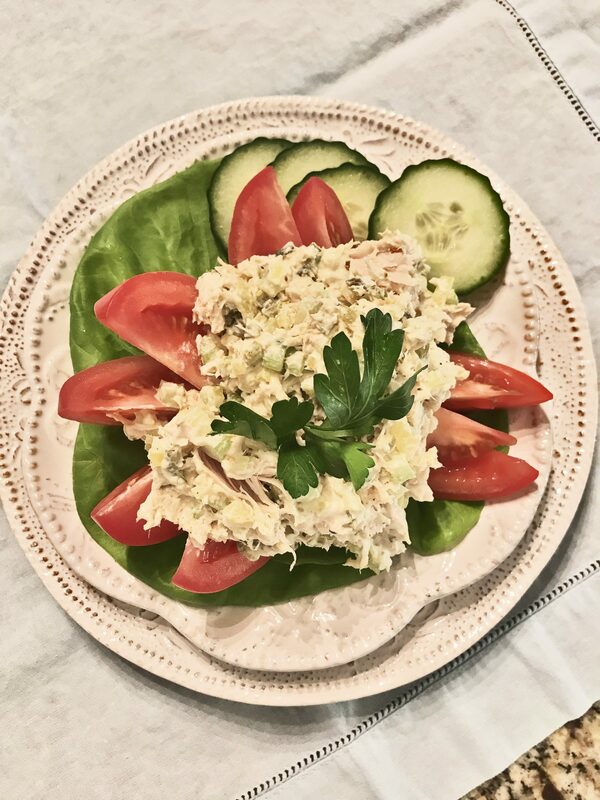 Perhaps it’s the preparation and ingredients in making a yummy chicken salad that historically lends it to being a summertime dish. The cool mayo, crisp celery and chilled chicken. But, a creamy cold side of chicken salad can be—and should be—enjoyed any time of the year. Therefore, by the powers vested in me by the great state of North Carolina, I’m liberating chicken salad from the exile of summer to a year-round dish! That’s right. I said it. Now, plopping down a luscious scoop of chicken salad on a bed of lettuce might suit everyone’s palate. But what about chicken salad as part of your meat-and-three? Serve with a starch and steamed vegetables and voila! You have a meal. But, if you are going to do a salad, make it interesting. Take some crisp romaine and add some tomatoes, avocado and radishes. Or mix things up a little with spinach and arugula and maybe some diced green apple and toasted pecans. Any way you serve it up, a chicken salad dinner will be sure to satisfy. Oh, don’t forget the croutons or a side of toasty baguette. Aren’t we all tired of the same old limp sandwiches or greasy burgers and fries for lunch? Live on the wild side and try something new. Having chicken salad with your favorite crackers or some bread (try drizzling with some great olive oil) is a lunch worth having a couple times a week. Or even with some fresh raw vegetables such as carrots and bell pepper strips. Try scooping out a tomato and filling with chicken salad for a real treat. Of course, if you love your sandwiches, chicken salad can be spread between two slices of your favorite bread. To spice it up a little, consider making an open-faced chicken salad melt (like a tuna melt) with a cup of your favorite soup. I wouldn’t suggest a pairing of chicken noodle soup though. Let’s try to keep things diverse and creative… and do some justice for chicken salad. Chicken salad can literally be placed on top of any edible vehicle and popped into your mouth. Crostini, cucumber rounds, tortilla chips, celery sticks, pickle chips. Of course in the south we love our Ritz crackers! Place a dollop of chicken salad on top of any of these things and I’ll assure you—it’s pure bliss. And they will be gobbled up quickly by all around. The different flavors and textures will have your mouth doing a happy dance! Well, the Carolina Panthers may not be in the Super Bowl this year, but it is the biggest party night in America. I personally like the commercials. But if you’re hosting or attending a Super Bowl party you could always try bringing or making a dish of chicken salad as an appetizer (see above). Or how about chicken salad sliders… Maybe melt some cheese over the top. I’m sure they will be a big hit! From this day forth, chicken salad shall no longer be considered a treat to enjoy only during the summertime. But, whatever you do, however you serve it, please do chicken salad some justice. Mix it up, be creative. And most importantly, make it taste exceptional!